Our Story - Rasha Pistachio Co.
Mr. Zia Hosseini is the Managing Director of Rasha Pistachio, member of R.P.P.C. Due to his position as the Head of Sirjan Pistachio Syndicate he is amongst others in Sirjan indicating the price of Pistachios. He pays special attention to every phase of the pistachio industry to ensure top quality and customer satisfaction. He believes in a long lasting business relationship with every customer, which creates a win-win situation for all involved parties. We believe in father-to-son-mentoring. The father-son business is now thriving in its fourth generation with Ali Hosseini as the Sales Manager. He grew up in the pistachio industry and worked for the Marketing & Branding and Sales department of Rasha Pistachio. He started working as a Sales Manager in 2013. Ali Hosseini is responsible for acquiring prospects worldwide and the Business Development of Rasha Pistachio. His focus lies on the European market. Rasha Pistachio is a family owned company located in Sirjan (Kerman province of Iran). 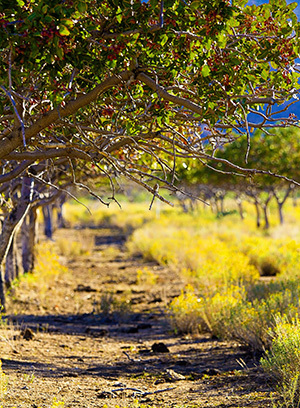 Sirjan is known as one of the most primary Pistachio grounds for premium quality products in Iran. We have been growing pistachios for more than 100 years, the first farm of pistachios cultivated in 1895 by Mr. Seyed Mehdi Hosseini, grandfather of the current Managing Director. Mr. Seyed Ali Hosseini was father the current Managing Director who inherited the farms and continued cultivating and growing pistachios on 100 hectares of personal land. Rasha Pistachio is one of the leading manufacturers and exporters of premium Iranian Pistachios globally. We aim to continue growing and exceeding customer requirements by producing and exporting pistachios to customers worldwide. Pistachios, while using our comprehensive modern processing facilities to stay ahead of current technological advancements. Rasha Pistachio supplies local and international distributors and is keen to explore new business opportunities worldwide. Based on our experience, we understand our client' requirements and we are committed to high quality and service. Our goal is to ensure that our clients benefit from their investment. We perform mandated testing based on the country of destination in our own laboratory. As a customer-focused company, multiple testing is conducted in order to fulfil all requirements prior to any shipments.